Kindle Countdown! 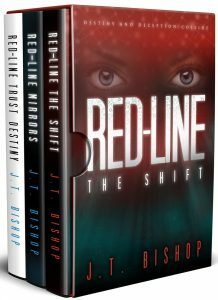 Purchase all 3 books in the Red-Line trilogy for only $3.99 on Wednesday, Oct. 17th. Price increases $1 per day through Friday, Oct. 19th. Regularly priced at $9.99. She’s a unique member and the last hope of an alien community living on earth, but can she live long enough to save them? The Red-Line Trilogy Box Set includes the first three books in the exciting and compelling Red-Line series. Readers call it “hard to put down,” “excellent,” and “a fun read.” If you love compelling characters, unexpected twists and fast-paced adventure, you’ll love this page turning series by award-winning author J. T. Bishop.